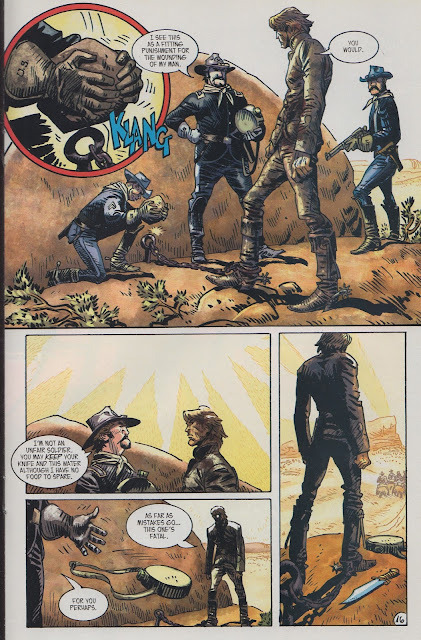 Matching Dragoons: Jonah Hex V2 #23 "Who Lives and Who Dies"
Jonah Hex V2 #23 "Who Lives and Who Dies"
"Who Lives and Who Dies"
Our story starts with the sun beating down on Jonah Hex who finds himself chained by the ankle to a large iron eyebolt next to a massive stone in the middle of the desert. The voiceover (aka caption) is a wondrous thing and does not belong to Hex. We quickly learn that it is that of a man, school teacher by trade, sporting only one arm by way of terrible misfortune. He is explaining the value of common sense to his class and launches into the tale that comprises the bulk of our book. He explains how he and three companions had been charged, by a Chicago newspaper, with photographing the Apache. 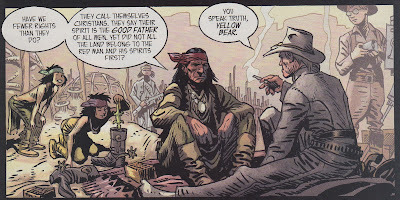 They had hired Jonah Hex as their guide, at times fearing him more than the Indians they sought to chronicle. After several weeks, they locate the Apache in a canyon and with Jonah along, the time spent is calm and fruitful. The chief explains to Jonah that they fear the Kiowa since the Great White Father has moved many tribes into closer proximity to each other. Shortly thereafter, the Kiowa, in fact, do attack and the school teacher scrambles for the safety of higher ground as Hex and the Apache do battle with the Kiowa. Unfortunately, during his escape, the school teacher knocks loose a large rock and both he and the stone tumble to the canyon floor with the massive rock crushing the school teacher's left arm and pinning him to the ground. 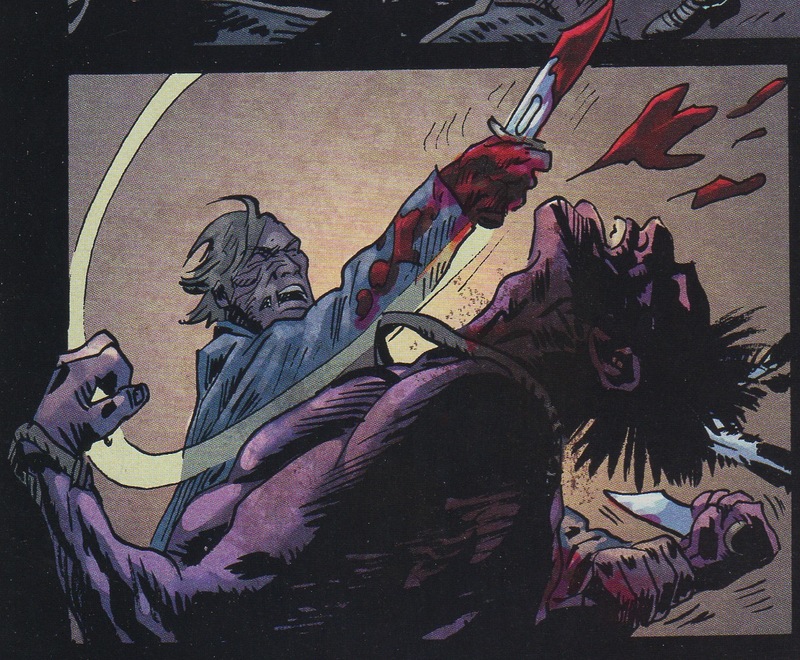 After the fighting has abated, Jonah comes over to the man, and using his saber, cuts off the teacher's arm. The teacher awakens several hours later to darkness, a campfire and Apache standing watch. Two nights later, Hex and the teacher are talking about phantom pains and the fact that the Kiowa, although beaten back are still fixing to attack again. Hex explains that the Apache chief, Yellow Bear, is dead and that he plans on killing the Kiowa chief himself. The Kiowa themselves are pinned in a canyon with a large group of US soldiers on the ridge above them. They order an Indian with them to inform the Kiowa below that food parcels will be tossed into the canyon and that the Kiowa should surrender peacefully. The parcels are delivered but when they are opened the Kiowa discover bundles of rattlesnakes. While the Kiowa are disoriented, the soldiers open fire on the tribe below. Just then Hex appears and is ordered to halt by one of the soldiers. Jonah requests to see the commanding officer and is take to Col. Davidson. Davidson, taking ill note of Jonah's jacket, demands to know why Hex is there. Jonah explains that there is an Indian in the canyon that he has personal business with. Davidson and Hex exchange multi worded insults that result in Davidson pushing Hex backwards into the canyon. On the canyon floor, Jonah pulls his knife as several Kiowa advance on him. 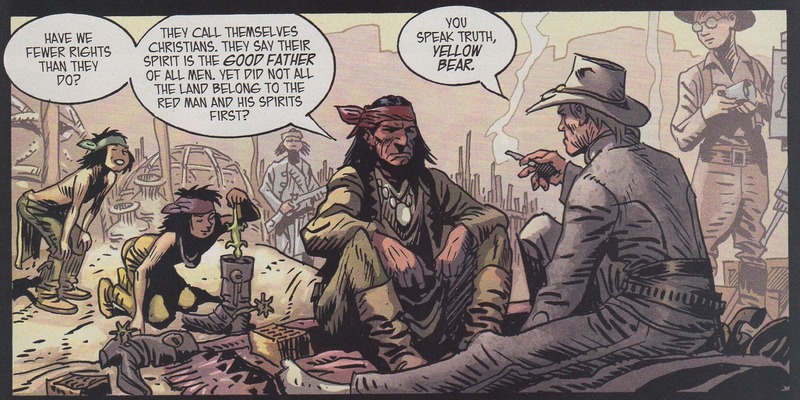 He calls out Chief Iron Heart, stating that he is there to avenge Yellow Bear. Jonah and several Kiowa battle it out as Davidson's men gleefully watch from above. Eventually, one of the soldiers ventures too close to the edge and tumbles in. Jonah accidentally stabs the man in the thigh but does defeat the remaining Kiowa. Davidson tosses down a rope, retrieving his man and Jonah both. Davidson decides to take revenge on Hex for stabbing one of his soldiers and calls for a leg iron and a spike. That morning we find Jonah shackled and the spike being driven into the base of a very large stone (taking us back to our opening scene). The Col. states that he has no food to spare but he is not an unfair man, he allows Jonah to keep his knife and a canteen of water. The soldiers then ride off. Once alone, Jonah breaks off some sagebrush and piles it around the spike. He waits several hours for the sage to dry and then pulls a few matches from his boot. He lights the sage of fire, heating up the spike and then douses the flames in an attempt to crack the iron of the spike. He hacks at the spike with the knife but is unable to free himself. Finally the teacher locates Hex and asks how he can help. Jonah instructs the teacher to urinate on the spike in a further attempt to crack the hot metal. We flash back to the classroom, with the students begging to know if their instructor rescued the bounty hunter. He assures them that Jonah was indeed freed and he dismisses the school for the day. When his personal reflections resume, we find Davidson is now shackled to the spike and the teacher has his camera tripod at the ready. Jonah has demanded that the teacher take one photo every hour until Davidson either frees himself or expires. The teacher refuses and pulls a rifle on Hex, demanding that Davidson be released. Jonah ponders the situation for a moment and then hands the shackle key to the teacher. The teacher unlocks the cuff and Davidson immediately grabs the rifle and kicks the teacher to the ground. Davidson takes aim, but Hex has already cleared leather and has unleashed the bullet that pierces Davidson right between the eyes. Hex then rides off, leaving the teacher with the Col's corpse. Timeline - A week of travel to the Apache camp, three nights prior to locating the Kiowa and then possibly another day or two to find and shackle Davidson. 12 days. The history of the Apache and the Kiowa relocations took place over several years but this probably falls into place around 1874-76 time frame. This one makes up for last issue. Bernet's art is gritty, yet full of action. There are small little things like the Apache kids putting a lizard in Jonah's boot that bring a smile to your face. The people have great expressions and each character looks different. I have said before that I enjoy the Hex books that are narrated. Around this time in DC comics, they decided to have the captions all be stream of consciousness but from a character's point of view. They would have a small logo in the corner, as an icon to let you know who was speaking (bat symbol, red S, and so on) Sadly, they used a convention of colored text on differently colored background so at times it was unreadable. 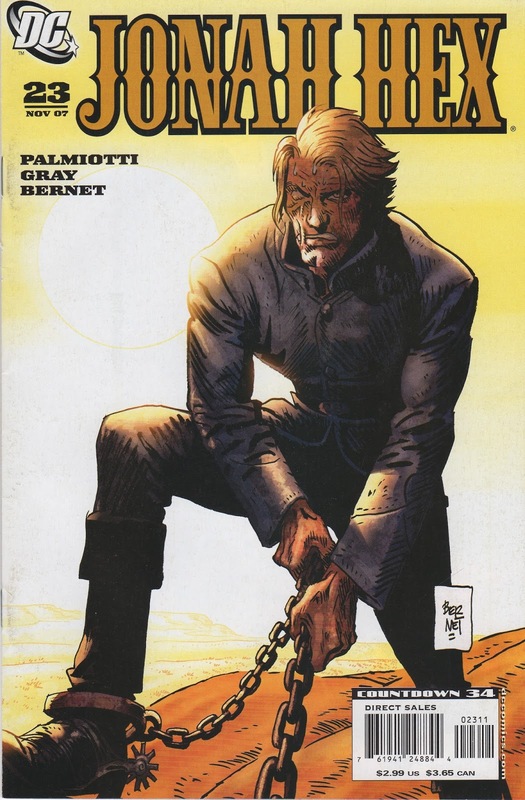 DC could have made a huge mistake with continuing this format in the Hex books, But Palmiotti and Gray wisely took this concept and removed it one step away from the main character. In their books, we never hear Hex's inner thoughts, any exposition is done by an outsider, someone other than Hex himself, and we are treated to dialogue befitting any letters written during the Civil War or any words plucked from a Cohen Brothers movie. Once again, I find myself reading these books aloud, relishing the flow and lilt like the delicate smoke ring on good pulled pork. Next Issue: Bat Lash, El Diablo, The Wicked Witch and... what else do you need?